UPSC Exam Calendar 2018 (यूपीएससी परीक्षा कैलेंडर – अधिसूचना, ऑनलाइन आवेदन की तारीख, परीक्षा अनुसूची) Union Public Service Commission has been released the UPSC Exam Calendar Pdf. The UPSC is the Permitted body of Indian Government and it is Government Jobs Recruitment Organization which is responsible to fill up the empty seats by the Conducting Several Exam and arranging interview. Every year, UPSC conducts various competitive exams and give the job opportunities to individuals. applicants who are preparing for Central Government Jobs Exam then can check the all exam details such as UPSC Annual Exam Notification, date etc. through UPSC Exam Calendar from here. By the UPSC Exam Calendar applicants can prepare for their exam well and accomplish their mission of being recruited in UPSC Jobs. The Union Public Service Commission conducts the individuals exam which includes Engineering Service, Civil Service, Combined Defence, Naval Academy, Nation al Defence Academy, Indian Economics Service/ Indian Statistical Service Exam, Central Armed Police Forces Commandant Examination etc. All the examination are a part of recruitment drive and are conducted every year. The recruitment advertisement is published first and then candidates can apply online through the official website of UPSC i.e. www.upsconline.nic.in. Currently UPSC has released UPSC Exam Schedule for 2018-19 session. Here we have shared the UPSC Upcoming Exam Dates for the 2018 session. Eligible and interested candidates can tally UPSC Online Apply Date through below the given table. 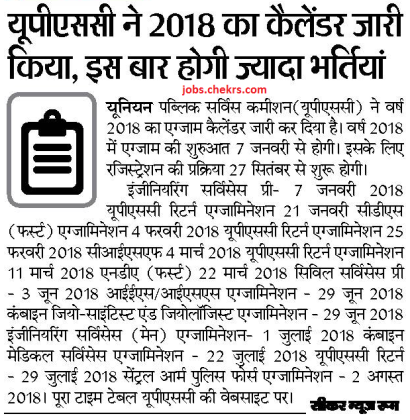 To receive more updates on UPSC Exam Calendar 2018 keep visiting our site www.jobs.chekrs.com. We aim to provide you latest updates on UPSC Recruitment 2018 along with UPSC Exam schedule. Incase of any query or review in regards to Latest Defence Jobs Notification, you can place your valuable comments in the commenting section below. We will revert you in a short while.